Heya West Coast wanderer, wait 'til you see the treats we have in store for you. We'll be immersed in cool California vibes after a stint in Nevada's wild Vegas. We'll hit the slopes in Lake Tahoe, people watch from coffee shops in San Fran & get a make new friends. 7-days abroad never looked so good. We dust the snow off our boots this morning and make way to the city for the final leg of the adventure. Bye bye mountain air, it's been real. Colourful characters, freethinkers, and artists have all descended upon San Francisco to make this place an historically eclectic place. 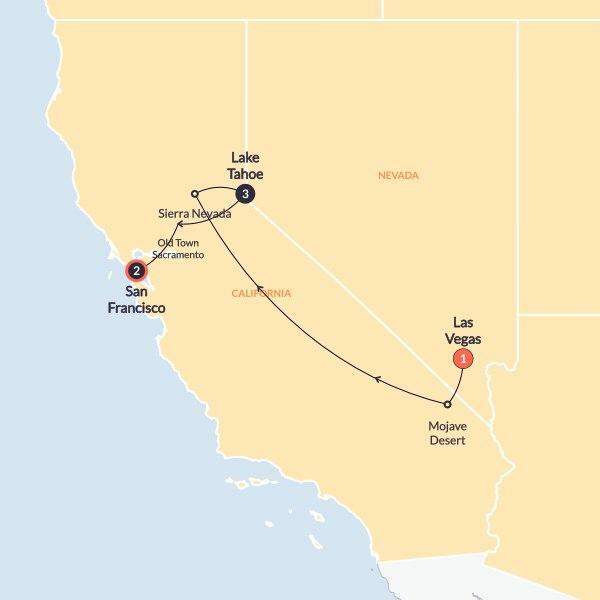 Via Oakland and the Sacramento Valley, we to descend upon the treasure of beatnik culture, cable cars and the Golden Gate Bridge.On our drive, we'll roll back the clock at Old Town Sacramento. Re-fuel on some lunch (your Trip Manager will give you a local recommendation) then we're back on the road towards tonight's stop.Colourful characters, freethinkers, and artists have all descended upon San Francisco to make this place an historically eclectic place. Via Oakland and the San Joaquin Valley, we to descend upon the treasure of beatnik culture, cable cars and the Golden Gate Bridge. Now that you have the city sussed you can dive a little deeper and tap into what you didn't tick off yesterday with a full free day to do your thing, with a bike tour thrown in for good measure. On two wheels, we'll cross the Golden Gate Bridge, go past Fisherman's Wharf and Crissy Field - some say the bridge shows off some of her best angles from this spot, and with us you'll get right there. See the sea lions of Pier 39, grab a chowder bowl, an Irish coffee at Buena Vista cafe in your free time, kick it in Chinatown or take a ferry ride across San Francisco Bay to Alcatraz. As the old saying goes 'I left my heart in San Francisco' will ring true as you prepare to depart tomorrow. But first, the home of chowder bowls - yet another tick box as you sink into fresh clam chowder and soft sourdough bread bowls. Prepare for a collective mmmm. When night falls, we'll head to Chinatown for a tour and slurp on noodles, egg rolls and dumplings. We always provide comfortable accommodation in a relaxed atmosphere - think comfy, centrally located twin share rooms and the best crew to travel with. You'll enjoy some of our favourite Californian hotels, including the Lake Tahoe Boutique Hotel. We'll get 5 of your meals and you get the rest. You can refuel over breakfast and grab some authentic American dinners from us but you'll also get an opportunity to sample some of this country's best feeds.